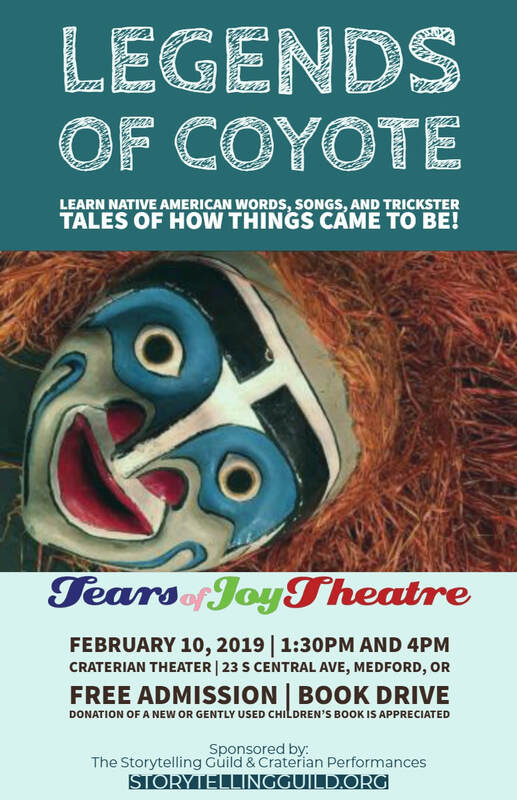 The Storytelling Guild partners with Craterian Performances to bring two free performances to children of the community. A professional puppet theater group is hired for these performances to give children, many who would not otherwise be able to attend the theater, a chance to enjoy a professional performance at no cost. Winter Program allows the Storytelling Guild to expose children to another form of storytelling, through the magic of puppets. Children are asked to bring a book donation to this event to be distributed with our ‘Pass the Book’ program. Special thanks to Rogue Regency Inn & Suites for donating lodging for our puppeteers. Coyote the Trickster is up to his old games and caught in his own trap. This practical joker of the animal world attempts to pull a fast one on Human and, when the trick turns, finds himself trapped in the Cedar Tree. Coyote tries his wily ways on Raven and Woodpecker in hopes they will free him from his trap. Eventually our hero escapes but, like most trickster tales, getting there is most of the fun…at least for the audience! So how did that rascal Coyote get his name? When the chance comes to choose a new name Coyote decides to get a better one. Surely he deserves a powerful name such as Grizzly Bear, Eagle, or Salmon. Determined to be the first in line to choose Coyote attempts to stay up all night but his plans go awry when he falls asleep and wakes up late. The theatre is recognized nationally for its commitment to excellence and innovation. Four of their productions have received American puppetry's highest honor, the Citation of Excellence in the Art of Puppetry. Tears of Joy performs in theaters, community centers, festivals and schools throughout the U.S. and abroad. Each year they perform for over 250,000 people.